Assad's Speech: A Method to the Tyranny? The epithet that seemed to be perpetually attached to the Arab League was "toothless." On Sunday, Jan. 22, however, the organization bared its fangs at Syria. In the absence of a detailed political road map from the Syrian opposition, the Arab League presented its own audacious plan, calling on Syrian President Bashar Assad to relinquish power to his Vice President, who would then form a national unity government within two months of early parliamentary and presidential elections. The proposal, outlined by Qatari Foreign Minister Hamad bin Jassim al-Thani in a press conference at the league's headquarters in Cairo, also demands that Assad begin a national dialogue with the opposition within two weeks and that the unity government, within three months of its formation, elect a council to write a new constitution. "I call on Syrian authorities to accept their responsibilities before God and their people and the Arab nation," Sheik Hamad said after a nearly five-hour meeting of Arab Foreign Ministers in Cairo. "We know that Syria has entered a period of violence and counterviolence." He added that the members of the opposition "are arming to defend themselves." The Arab League had met to consider a report submitted by Sudanese General Mohammad Ahmad al-Dabi, head of the league's monitoring mission in Syria. The monthlong mission, which wrapped up on Thursday, Jan. 19, had been tasked with verifying if Assad had implemented a signed agreement with the league to withdraw his tanks and troops from Syria's cities and towns, cease violence, free political prisoners and start a meaningful dialogue with the opposition. A low-level committee had recommended that the league's Foreign Ministers extend the mission by a month. But instead of diplomatic politesse, proceedings were thrown into disarray after Saudi Arabia stepped out of the background role it has played so far in the Syria crisis to forcefully push for an end to the Syrian government's ferocious crackdown against its opponents. For months, Qatar has taken the lead on Syria. In a move that likely persuaded other countries, especially Gulf states, to take a stronger line against Damascus, Saudi Foreign Minister Prince Saud al-Faisal told his counterparts that his country would withdraw its observers from the much criticized league monitoring mission in Syria because of the continued shedding of "blood that is dear to us all." Assad had failed to comply with an Arab League plan to end the violence, Prince Saud said, adding that "all possible pressure" should be applied on Damascus to cease a blistering offensive that has claimed well over 5,000 lives in the past 10 months and, according to Syrian-rights groups, almost 1,000 since observers first arrived in Syria on Dec. 26. "We are calling on the international community to bear its responsibility, and that includes our brothers in Islamic states and our friends in Russia, China, Europe and the United States," Prince Saud said. 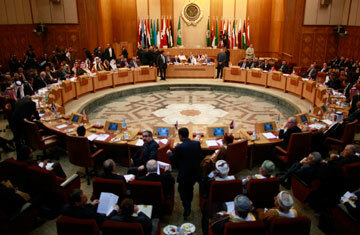 The strong Saudi remarks hardened deep divides within the 22-member Arab League over how to tackle the Syrian problem. Because of the disagreements, the Foreign Ministers' meeting, originally scheduled for 4 p.m. Cairo time, was delayed for several hours. When it finally convened, the meeting lasted nearly five hours. The decision to take its initiative to the United Nations Security Council did not receive the support of Algeria, which abstained, or Lebanon, which, once again in the grip of its larger, stronger neighbor Syria, rejected the pan-Arab deal. Sheik Hamad acknowledged that the Saudi stance had influenced its Gulf allies. "Saudi is an important country in the Gulf Cooperation Council," he said, referring to the political and economic alliance of six Gulf states. "It is like a father to all of the countries. We have disagreed with it many times, but this is the reality. If there is a clear opinion from the kingdom, the GCC will follow it."